Why should you board your dog when you’re away? Rather than leave your dog at home, mostly alone save for occasional visits from a neighbor, friend or relative to make sure there’s food and water in the bowl, it’s a better idea to have your pet stay at a professional boarding place like D’Tails. When your dog stays with professional dog caregivers, he or she is in good, capable hands to keep your dog exercised and engaged… after all, what do dogs crave? They love attention. They can’t get that when left alone at home. 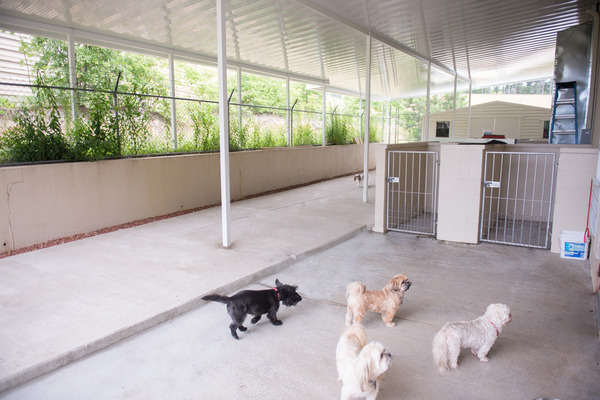 At a boarding place like D’Tails, they’ll have one-on-one attention from staffers who’ll make sure they go for walks, do some running, and, most importantly, play! Even when the outside weather is yucky, you can rest assured that your dog will be moving around and engaging with other dogs, as well as loving, caring humans, indoors. They won’t be lonely. Socialization is so important for dogs. Letting them socialize at a professional boarding place like D’Tails is smart because it’s a controlled/safe environment. Playgroups are put together based on a dog’s size, age and temperament. So you don’t have to worry that your beloved pet is going to be scared or intimidated. If anything, just like you’d hope little kids would enjoy playing with each other, you can feel good knowing your dog is hanging out, having a good time with other dogs just like him or her. And, by the way, if your dog isn’t good around other dogs, D’Tails can make accommodations such that he or she doesn’t have to socialize if he or she doesn’t want to! When you leave your dog at a place like D’Tails, you can trust that the staff know how to handle dogs– perhaps better than a random person who’d “watch” them for you at your home or their home… If a vet is needed, God forbid, then a vet will be consulted. If your dog needs regular medication, the folks at D’Tails make sure medical needs are met. With over 40 years of experience creating a “home away from home” for dogs, D’Tails is the kind of place you can feel confident about– your dog will play all day, rest all night, and go home happy. Call 706-731-0089 for more information.